Paula's Dollyland: New dollies and a new house! I have no idea what I have been doing in Dollyland this week lol I seemed to be in there fiddling about everyday but couldn't think of anything new to show you!! The music shop is coming along but will wait just a little longer before showing you that. 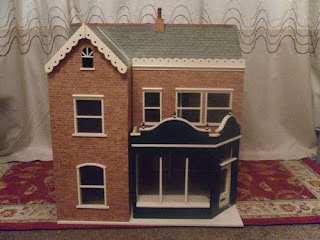 I did manage a trip to the Dolls house shop in Inverness on Saturday and got a few new goodies but cant show you those yet either ha ha!! I do have so new dollies to show you though!! I do love new people in the village every one is a new character and I can never have enough!! First up is Dorothy a new WI lady. She is serving up the tea for the rest of the ladies although Elsie is already on the sherry! Lynda is just making sure the hairnet is neatly in place! Thora is enjoying her cup of tea and gossip mag! I love this scene, its so much more fun now there are some people in it! 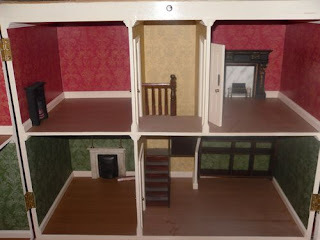 Then we have Stanley who runs the dolls house shop. He is busy building a dolls house for a new customer! And last but not least is Arty. Today I made him a straw hat, not bad for a first attempt! He was planned to go in the music shop but I thought he looked more like one of those antiques dealers on bargain hunt so he's now residing in the junk shop instead! 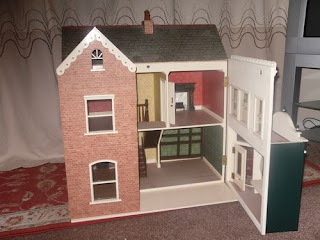 I have also bought a new house!! I wasn't convinced the Christmas one was really right it was just a little too modern inside and I am rubbish at changing them as its right for the house and I don't want to spoil them!. I spotted this lovely Honeychurch shop on Ebay and it was a great price. Its all decorated in red and green perfect for a Christmas theme! Its still in the packing stages as the lady kindly agreed to pack it up for a courier and finding a box that big is never easy so I am more than happy to be patient! Lastly I picked up this months copy of The Dolls House magazine and it came with a free book. Its a great read with loads of good pictures and although the mag was £4.75 I thought that was a good price for both! I like the new house, the store and office are downstairs and then you have a bedroom and bathroom upstairs for the store owner to live on the premises! it's going to look wonderful when you are done. There's just no stopping you is there - no one every believes you now when you say there's no more space! 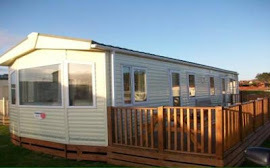 I like the new house too and great excitement for you in planning the new spaces. It's nice to see a customer in the hairdressers too. She looks very relaxed with her gossip mag!